The Italian economy suffers from a huge lack of domestic demand and purchasing power, as well as from competitiveness issues. 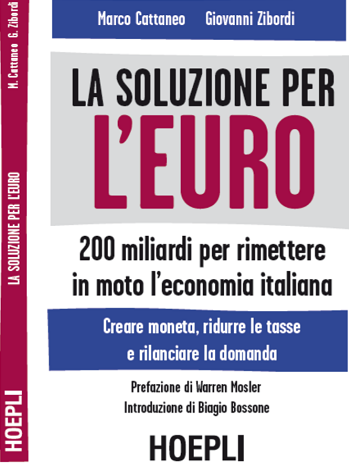 Injecting purchasing power in the economy and reducing taxes are therefore preconditions to solve the crisis. Doing this by increasing public debt is restricted by the Eurozone governance framework. In addition, it would not be desirable anyway, primarily because increasing the debt to be reimbursed in a currency that Italy cannot issue (the euro) carries a default risk. This is why we devised Fiscal Money. Fiscal Money would not increase the Maastricht Debt, which only includes financial liabilities to be redeemed in cash. We verified this debt-related issue extensively from both a legal and an accounting standpoint. But it is also important to add that the reason for not including non-payable tax liabilities (i.e., Fiscal Money) in the Maastricht Debt is a matter of substance, not just of form. The reason is that a non-payable liability does not bear any default risk due to the lack of repayment capacity from the issuer of the liability. Italy could thus stop, once and for all, increasing its Maastricht Debt, and could inject Fiscal Money into the economy just up to the level required to restore full employment. The value of Fiscal Money would be guaranteed by the Italian government’s committment to accepting it in exchange for rebates on tax obligations. As long as the Fiscal Money made available to the taxpayers were just a fraction of total gross tax receipts, the guarantee would be very solid (even in the event of a severe economic slowdown). This is in fact what we envision, since our base case projections posit Fiscal Money issues to peak at approximately € 100 billion per year, which compares to € 800 billion total governmental receipts. In any case, even the overissuance of Fiscal Money would only depreciate its value vis-a-vis the euro – but would in no way create any additional default risk on Italy’s Maastricht Debt obligations. The Fiscal Money program would therefore (1) be totally consistent with the Eurozone governance framework, (2) revamp Italy’s domestic demand and competitiveness in Italy, and (3) not require any financial transfer or additional guarantee from either the ECB or the Eurozone partners. To the best of our knowledge and understanding, the program is by far the smoothest and most effective way to restore prosperity and financial stability in Italy and the whole Eurozone.